What about having a special day at A-Mazing Acres for your school club? That’s what our “Day at the Farm School FUNdraiser program is all about. Register your club or school with us and we will walk you through the process. It’s that easy. Earn money for your school or organization while having a great time. We will make a donation in the amount of $2 per admission for your school or club during your “Evening at the Farm”. We take FUNdraiser reservations for Tuesday, Wednesday and Thursday evenings. Students and their families will be excited to visit one of Michigan and Indiana’s most popular fall season attraction and know they are giving back! 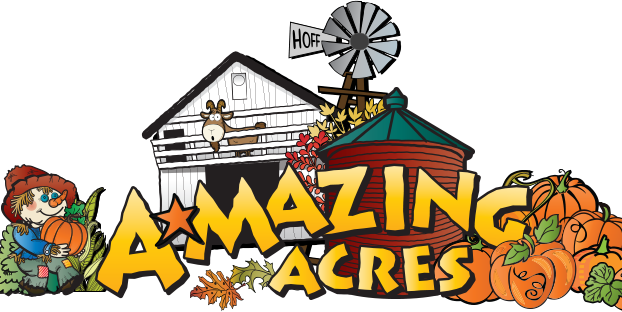 Most attractions at A-mazing Acres are included with the Whole Cob Admission. The corn maze, corn popper jumping pillow, Miner’s Mountain Slide, family pedal carts, barnyard, and more are included in the admission. Examples of activities that require extra money are the hay ride, the cow train,apple cannon shots, Hy-Stryker, Gem Mining and pumpkin or food purchases. Students, Parents, and Teachers build relationships as they interact socially. The Fall season timing makes for a great “opening social” for your school club! Contact us to find out just how to get started! We're excited about another fun Fall season at A-Mazing Acres Farm ... and especially this year, when we are helping Peanuts celebrate the 50th Anniversary of "It's a Great Pumpkin, Charlie Brown". Our Little Jane might have a new cousin soon!